Place lentils, water, and all the spices into a rice cooker and turn on. Cook for 60-80 minutes (depending on your rice cooker) or until soft. Alternatively, in a medium sauce pan, you can bring water, lentils, and spices to a rapid simmer over medium-high heat, then reduce the heat to a simmer and cook, uncovered for 20 to 30 minutes until lentils are tender. Wash lettuce and cabbage and slice or chop into thin strips, set aside. Follow the instructions for hummus. Toast 8 slices of bread in the oven at 450 F for 5 minutes. Flip toast and bake for another 5 minutes or until really crispy and dry (this will keep bread from becoming overly soggy with the dressing and lentils). Alternatively, rotate bread through a standard toaster or toaster oven. Make sure the bread is double toasted or extra crispy (not burnt but really crunchy). 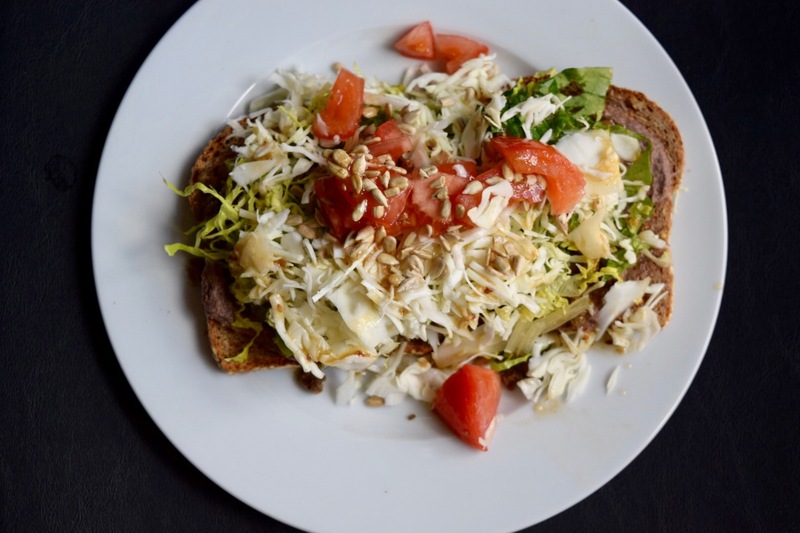 Lay 2 slices of double-toasted bread on a plate, spread hummus onto each slice and layer with a scoop of lentils, a handful each of lettuce, cabbage, and tomatoes, and then sprinkle 1 tablespoon of sunflower seeds and ½ tablespoon of italian dressing over everything. Enjoy! Lentils are a nutrient powerhouse! I love recipes that incorporate them into more “American”-type foods like this. Win-win!